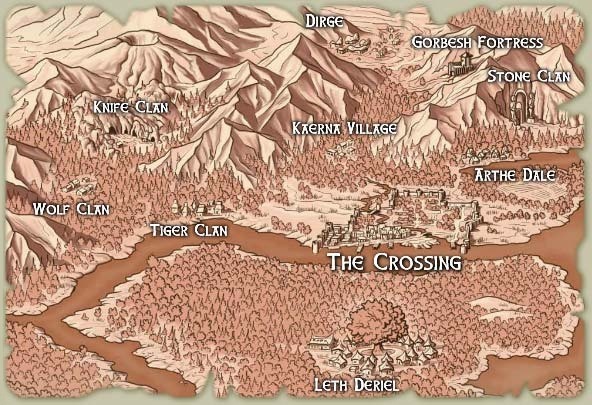 Darkstone, now known as Dirge, was one of the most important cities of the Seven Starred Empire and had a trade road going directly to Throne City. Today, it is known as Dirge, following the explosion of the Greater Fist in 277 AV, during which Darkstone and the Alshaerd estates were destroyed. 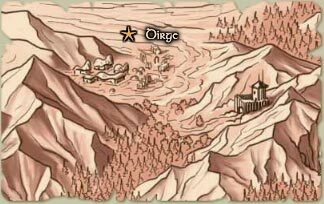 Description from HELP CITIES: Dirge, or as it was once known, Darkstone Town, is now in a sad state of ruin and lawlessness due to volcanic activity in the not-too-distant past that wiped out direct caravan access to the town as well as most of its farmlands, productivity and population. Now mainly a hiding place for criminals, thieves and other ne'er-do-wells, few decent people ever make the arduous journey there. Play.net Description: Living in the shadow of active volcano Greater Fist, Dirge is a bleak grey city of stern, hardened, determined people. Yet underneath the ash and rubble lies a once-charming village waiting to be discovered. Part of the lands held by the Magen family of Zoluren nobility, Dirge is a town that embraces its many contradictions just as much as it does its status as part of the borderland between Zoluren and Therengia as well as that between the holdings of the Magen and the Turmar. Citizens of other parts of Zoluren and travelers from abroad often comment on the town's seeming disrepair and the overall harsh lifestyle lived by its inhabitants, frequently blaming the government for not intervening directly. However, the residents of Dirge will loudly state to anyone who bothers to talk to them instead of just about them that they are just fine, thank you. The town's culture has evolved to actively seek out and embrace hardship as a way of making itself stronger and more prepared to deal with whatever may come its way, and the citizens of Dirge seem to hold this as a point of pride. So much so, in fact, that they are at times somewhat dismissive of people who hail from elsewhere as being far too soft to truly understand the world. During the brief reign of Prince Sirolarn, and part of the early reign of Prince Vorclaf, Dirge was in part run by the Dirge Council, which was formally led by Mordiazi Neus and other Adventurers. Inquisitor Anamir was the Prince's liasion to the Dirge Council during this time. The organization has since dissolved, and more traditional governmental oversight returned to the town. Outside of this brief anomaly, Dirge has been (and is currently) run by a mayor, who is appointed by the Magen family. The current mayor of Dirge is Hunlynd Turmar, a man with blood ties to both the Magen and their close neighbors, the Turmar. When asked about the oft reported criminal element attracted to Dirge, Mayor Hunlynd will laugh and say that such rumors are exaggerated and mostly a product of outsiders misunderstanding and misinterpreting aspects of normal, law-abiding Dirge life. 600 BL -- The reign of Qoemeth begins. When 25, Empress Qoemeth asked the Compact to open a tomb to the west of Darkstone which the War Mages couldn't get into. They did it and recovered some artifacts, the records of which have been lost. 236 BL -- Darkstone is taken by Lanival during the Resistance War. In 106 AV Zoluren and Therengia fall into dipute over the borders of their provinces. This becomes known as the Faldesu Conflict and fighting erupts near Sicle Grove. A summit is held in Darkstone which results in a successful treaty. 277 AV -- The Greater Fist erupts and destroys Darkstone and the Alshaerd Estates. Divorce Blades can be obtained from the acolyte in the tent inside the town's Temple of the Volcano. Iron Mountain Weapons - Best storebought light-edged weapon for backstabbing, the stout short sword. Inside the gate of souls offers a Ushnish altar. Dirge is believed to be the favored city of Botolf, who frequently visits. This page was last modified on 24 January 2018, at 10:54.